We know eating breakfast is important—but how does it actually affect our health? 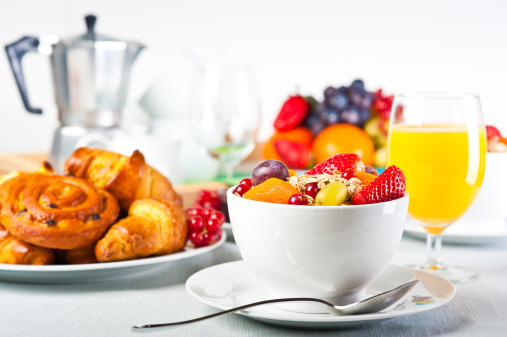 Here are five health problems that could be remedied simply by eating breakfast. When you skip breakfast, you deprive your body of a source of fuel that it can use to get you through the day. As a result, hunger will kick-in before lunch rolls around. You may find yourself craving a burger, fries, and dessert. Avoid over-eating at lunch and dinner by giving your body a healthy meal first thing in the morning. Keep your metabolism working steadily, burning calories all day long for you, by eating small meals frequently throughout the day. A recent study has shown that when we skip breakfast, our bodies slip into a state of insulin resistance over the short term. You don’t want your body to go into “insulin-resistance” mode even temporarily. It’s insulin that allows glucose to travel into your cells to maintain proper functioning. When glucose doesn’t get into your cells, there’s no energy supply. When you eat breakfast, your glucose levels rise, insulin production is triggered, and glucose is able to reach your cells. Healthy breakfast foods contain vitamins and minerals that can help boost your daily intake of these important nutrients. Take the time to eat first thing in the morning and get those fresh blueberries added to your yogurt or cereal. Along with vitamins and minerals, you’ll get a dose of antioxidants too. Don’t forget the oatmeal—it has fiber, including beta-glucan which has been shown to help reduce cholesterol levels. And what about yogurt? Add it to your breakfast meal, and you’ll start the day by adding some friendly bacteria to your digestive system. And finally, that morning cup of coffee can be beneficial too: it’s been shown to stabilize blood sugar levels in recent studies. Often the reason a person will give for skipping breakfast is that they’re “not awake yet.” You know the feeling: the alarm goes off, you hit the snooze button a few times, and then finally you drag yourself out of bed and jump in the shower. You grab a cup of coffee or tea and then head out the door. You’ll worry about eating later when you’re wide awake and your stomach starts to tell you you’re hungry. While this may seem perfectly fine at the time, it’s better to eat something before you start your day. The truth is your body will begin to conserve energy when you skip breakfast, having no new source of fuel since your last meal the night before. The result is that you’ll feel sluggish and even more sleepy. Try eating at least a light breakfast consisting of a fruit smoothie. Add a little protein in the form of soymilk or yogurt, throw in a banana or another fruit, and add a tablespoon of flax or chia seeds for some healthy fats. All of the nutrients in these foods will give you an energy boost, though the protein in particular will sustain your energy levels until you have time to sit down for some lunch. “Skipping Breakfast May Raise Diabetes Risk: Overweight women who ate morning meal had lower blood sugar,” MedlinePlus web site, June 17, 2013; www.medlineplus.gov, last accessed June 20, 2013. Veasey, R.C., et al., “Breakfast consumption and exercise interact to affect cognitive performance and mood later in the day. A randomized controlled trial,” Appetite. September 2013; 68: 38-44. Liu, J., et al., “Regular breakfast consumption is associated with increased IQ in kindergarten children,” Early Hum Dev. April 2013; 89(4): 257-62.